I just discovered the cutest design girls from Atlanta, Cassi and Brandy, via My Space (of all places! ); it seems they're making their way around the design blog circuit (yeah! ), so I figured I'd show them a little blog love, too. Sure, Fabricate Design creates lovely pillows and tees, but extra love should be shown because these girls not only are best friends doing their own thing, but they are young and just getting started, so big love to the indie set! 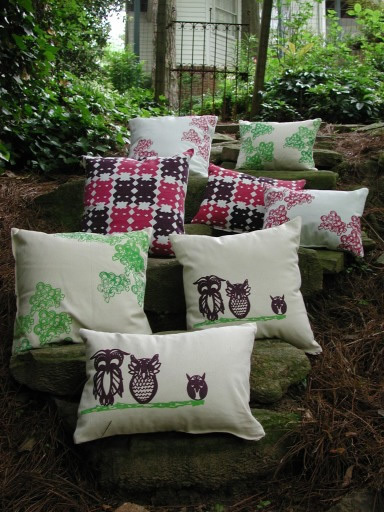 Who knows, they may be the next Hable or Judy Ross in the years ahead... And for only $32-35 per pillow, I'm sure you can't resist these perky prints - so fun and totally affordable. The rainbow bunches pillows are my personal favorites - the swirly design reminds me of the motown fabulous show I watched as a kid, The Electric Company.